Eldridge Plays and Musicals. 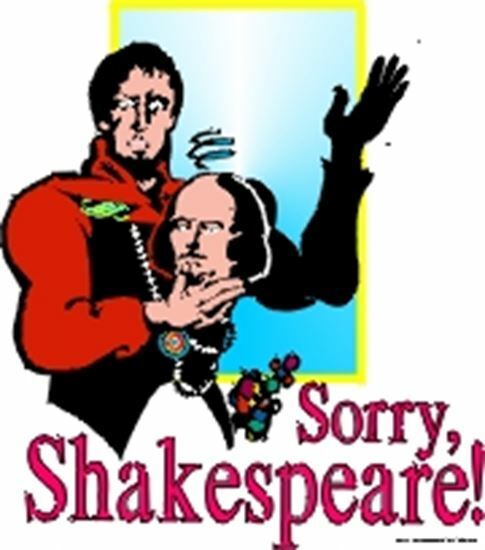 Sorry, Shakespeare! Four high school students report to the school auditorium for play rehearsal only to find out the director is not coming. To add to the confusion, one of the cast members has dropped three rehearsal scripts, of which all the pages are unbound and unnumbered. The pages fly everywhere. No problem! - unless the scripts are "Macbeth," "The Taming of the Shrew," and "A Midsummer Night's Dream." As one of the students quips, "We don't know anything about Shakespeare, but it all sounds the same anyway, so grab some pages." The mayhem that results will have you wondering if this play is "to be, or not to be."